bin to iso and back.It can also convert BIN or any other format file created by CD burning software. 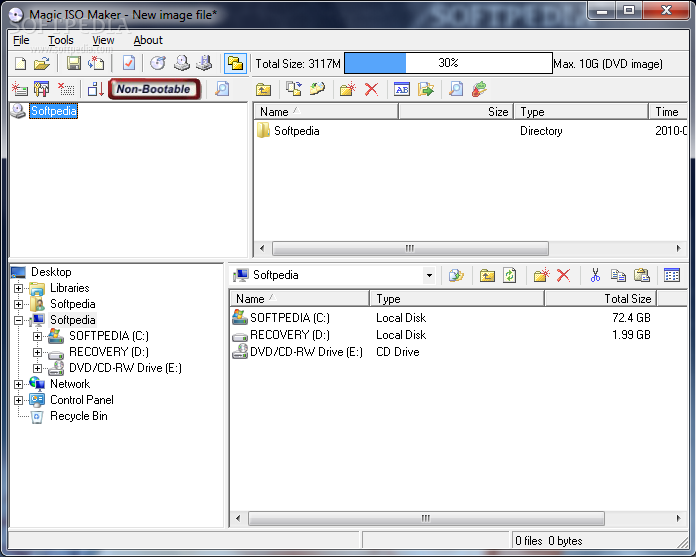 You can directlyadd/delete/rename files or folder in CD image file(s) with MagicISO. Can burn ISO file to DVD-R DL and DVD+R DL. Full supports Microsoft Vista x86 and x64 edition. Is Optimized for Microsoft Vista. Full supports creating/opening/editing/extracting/burning UIF file format which is a compressed/encrypted CD/DVD file format. Can compress ISO/CUE/NRG/MDS/CCD/CIF image into UIF file format. Can create password-protected UIF file format. Can create/open/edit/extract/burn APPLE HFS/APPLES HFS+ disk image. Can create Windows/Mac Hybrid CD/DVD image(ISO/JOLIET/UDF/HFS+). Added options to finalize CD/DVD disc. Fixed bug on decoding MP3 files. Supports burning MultiSession .mds/.ccd/.nrg CD image. Supports continuing MultiSession CD-R/RW, DVD-R/RW, DVD+R/RW. Supports directly burning CD/DVD image without saving(on-the-fly). Can edit audio/video/super video CD image in .mds/.mdf format. Can edit audio/video/super video CD image in .NRG format. Can edit audio/video/super video CD image in .ccd/.img format. Can rip audio CD into MP3 files. Supports writing of floppy disk image onto floppy disk. Displays LBA (Logical Block Address) of files and files in the iso image. Supports ISO 9660:1999 version 2 specification. Improve CD/DVD image file processing engine (optimize for speed and space). Supports burning CD/DVD image file to DVD+R/RW. Supports burning CD/DVD image file to DVD-R/RW. Supports opening/editing/extracting multi-session BIN image file. Supports making ISO image file from multi-session CD. Supports putting up to 32 bootable items into one multi-bootable CD/DVD image. Supports opening, editing, extracting disk Image file (floppy disk image in 1.2M, 1.44M, 2.88M). Supports viewing the properties of files and folders. Supports creating Multi-Bootable CD/DVD image files so that the user can install Multiple Operation System from one CD/DVD. New command parameter in command line utility (miso.exe) for creating CD/DVD image file with RockRidge volume. Query the user before overwriting the same name file or folder. Recomputes the checksum after editing BIN file. Supports burning CD in Mode 1 or Mode 2/XA format. Supports converting any CD/DVD image file to BIN/CUE. Supports long file name up to 221 characters. Add browser into searching file dialog. Can search files or directories with wildcard characters in CD/DVD image file. Can extract, rename, delete, open the found files. Improved CD/DVD image file detecting engine. Supports burning CD on USB connection CD-R/RW driver. Supports editing properties of CD/DVD image files. Supports correct volume serial number after editing original CD/DVD image file. Supports burn CD image files with UDF format. Supports loading and exporting none -enumeration bootable information. Supports loading “IMG” CD image file and convert IMG to ISO. » Ponilicious: A My Little Pony Friendship is Magic Forum!! !